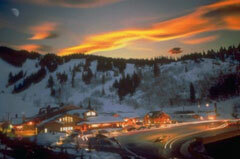 By far the most genteel ski resort in Utah, Deer Valley prides itself on pampering its guests. The moment you arrive, a 'guest service attendant' relieves you of your skis, plus there is s complimentary day and overnight ski storage. This softly-softly approach continues on the slopes, with some of the best grooming in the Rockies. They used to say it was almost impossible to fall on a groomed run here. However not all skiers want to be pampered. With this in mind, Deer Valley has openned up some challenging off-piste terrain on its four mountains. Flagstaff Mountain has it all: easy slopes, plus extensive tree-skiing for experts whilst on Empire you will find some pretty extreme skiing and a nice snow park.